Chicago has a bit of a thorium problem. The radioactive element, once heavily used in the making of gas light mantels, can now be found in contaminated superfund sites across the city. One of those sites also happens to be the long-delayed and much-anticipated DuSable Park in the downtown Streeterville neighborhood. While the park is on the Chicago Park District’s website, it has not been programmed or developed in any way. Now, 30 years after its founding, the park is set to finally be cleared of its radioactive waste, enabling its development into a usable public space. Located at the mouth of the Chicago River, immediately east of Lake Shore Drive, DuSable Park is named after the first non-native settler of Chicago, Jean Baptiste Point DuSable. An African-French-Haitian, DuSable was born on the island of Haiti around 1745 to a French mariner and a slave. After marrying and starting a family with a Potawatomi woman, DuSable settled at the mouth of the Chicago river. There he maintained a successful trading post and farm. Today his name adorns many civic institutions, including the DuSable Museum of African American History. Unlike that celebrated museum, DuSable Park has had a hard go since its founding in 1987 by then-mayor Harold Washington. Over the past 30 years, dozens of proposals have been made for the 3.24-acre site. At one point, it seemed that the park would be designed by Santiago Calatrava as part of the failed Chicago Spire development, which was to be directly west of the park. In 2001, Chicago artist Laurie Palmer established an open call for proposals for the site. That call resulted in an exhibition and book outlining 65 other ideas for the site. 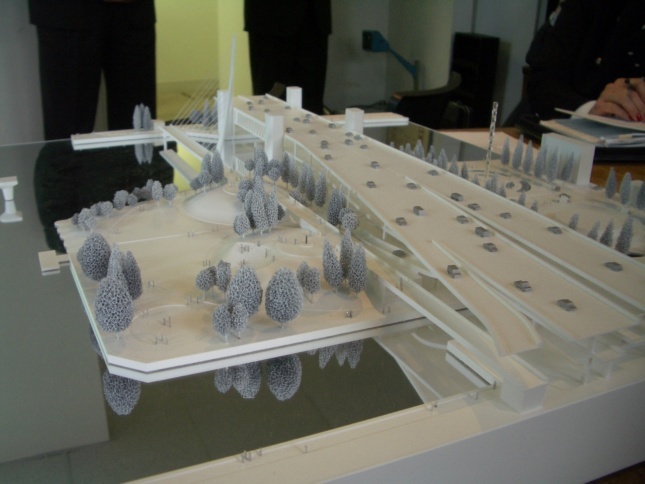 Yet it is still unclear what the future holds for the little park on the lake. First and foremost, the thorium contamination—first identified on the site in the 1990s—must be cleaned up. As part of a cooperative agreement signed with the Environmental Protection Agency (EPA) in June 2017, the agency will be providing $6.8 million to the Chicago Park District to facilitate that cleanup. While this is not the first attempt to clean up the park, it is hoped that attempt will completely remediate the site. Thorium, a naturally occurring radioactive element, is notoriously hard to clean up, in part because of how it gets into the soil in the first place. As with many other sites around Streeterville, DuSable Park’s thorium is likely from the Lindsay Light Company, which processed the material from raw ore and manufactured gas light mantles in the area from 1904 through 1936. Some of the waste from the refining process is a sand-like material called thorium mill tailings, which was often used as infill in the low-lying Streeterville. It is likely thorium mill tailings were used as part of the fill on the DuSable site, which is reclaimed land from the lake. A second costly factor in removing thorium is that is can only be trucked to a few disposal sites in the United States. The only one that is likely to take the waste from DuSable is in Utah. The money earmarked by the EPA for the cleanup comes from $5.1 billion settlement with the company that acquired Lindsay Light, the country’s largest environmental contamination settlement to date. Despite moving out of Streeterville in the 1930s, the company continued to give away the radioactive fill to home builders in the west suburbs. While thorium is far from the only environmentally disastrous legacy left by Chicago’s industrial past, it is one that is particularly troubling to builders. In most cases, the contamination is not a direct hazard to the public until the soil and concrete covering it are disturbed. On sites known to formerly be industrial, developers often have to conduct extensive testing before breaking ground. As is the case with DuSable Park, this can add time and money to already long projects. 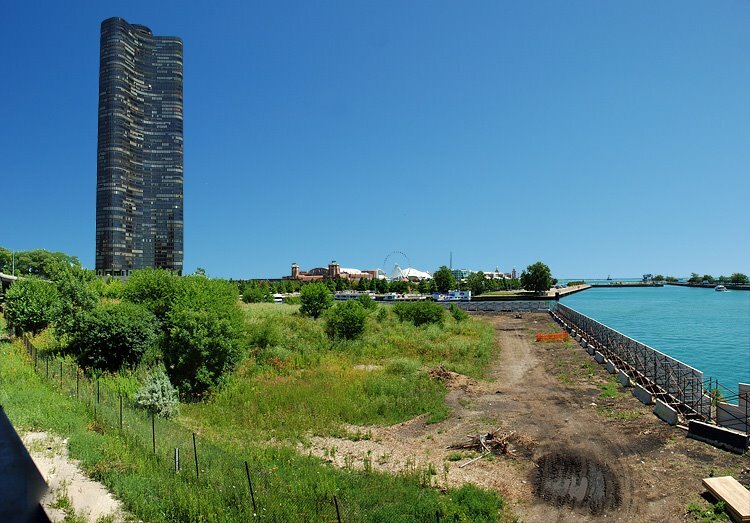 With the EPA’s help, there is now hope that Chicago will have a new growing, rather than glowing, lakefront park.